The Couch-to-5k (C25k) program is a widely used training regimen that helps new runners of all abilities and levels successfully complete a 5k after 12 weeks of training. The schedule includes walks, runs, and days off to rest. One of Sole Train’s (Recovery Café’s Running and Walking Club) volunteers was already familiar with the C25k program and adapted the program to better meet the needs of Recovery Café’s Members. The first cohort of 4 individuals completely new to running started the program in January 2015 in preparation for Seattle’s annual St. Patrick’s Day run. The very prescribed and incremental training program helped get all 4 of these runners to the finish line while also spreading a love of running. All 4 runners are still active in Sole Train today. This program is valuable well beyond the physical ones as a result of running. It builds confidence by showing Members they can do something they previously had thought impossible. Many of our runners still express shock in their ability to run a 5k (35-45 minutes) without stopping. It also brings Members and volunteers together in a setting where they are on completely equal footing. They have a shared goal with a specific end date and, during the training, nobody gets left behind. We have seen the positive changes that happen when a Member joins Sole Train. We have seen Members’ physical, mental and social health change for the better. Some Members have lost weight, or have been taken off medications. One Member, John, who is nearly 70, just ran his first half-marathon, after never running in his adult life until joining Sole Train. Runners have not only taken a more active leadership role in the club, they’ve also become more outspoken leaders in the greater Café community. 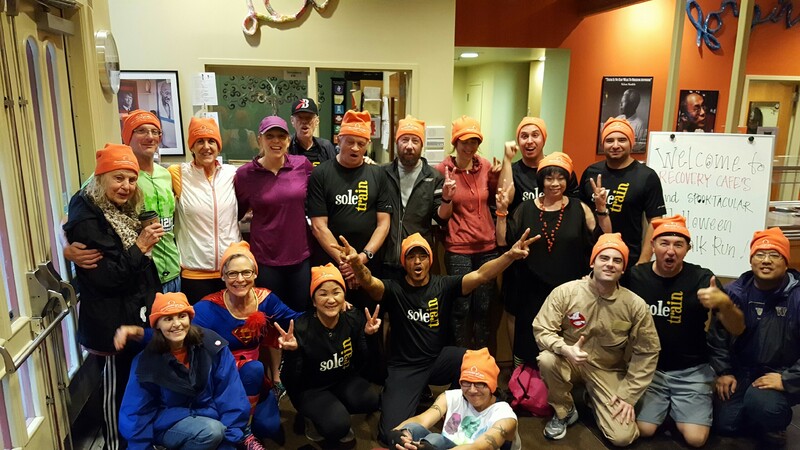 On Saturday, October 29th, 20 Café Members and volunteers came together to participate in Recovery Café’s annual Halloween 5k. There are no requirements for participation. 12 participants ran, 8 walked and all made it back to the Café to celebrate their accomplishment. Great job Sole Train! Thank you to all those who made this run possible including Brooks Running for their donation of shoes and to-go coffee mugs, Group Health for purchasing hats for all the participants, and Japanese Presbyterian Church for providing snacks and refreshments for every one after the race.